After last weeks fireworks the market has started off the week consolidating those gains and drifting back to support. That is a good thing for the market going forward and if we can get through tomorrow’s Fed meeting without any bad news/perceived bad news then there’s a good chance we’re going back to April/May highs. My timing signal is still on the sidelines but could give a buy signal tomorrow under the right conditions. I’d like to see us drift down to 2930 on the Nasdaq or 12950 on the Dow in the morning session and that may be enough of a contained pullback that I was looking for to get long on a market etf. The Fed meeting is like an earning’s report so there is more risk when taking on new positions before they conclude their meeting, but it may be worth it under the right conditions. I would like to see more stocks breaking out but that may still come. There is also a lot of room for the Equity Put/Call to drift lower before we are at any complacent levels that would cause one to worry that the market is too complacent. 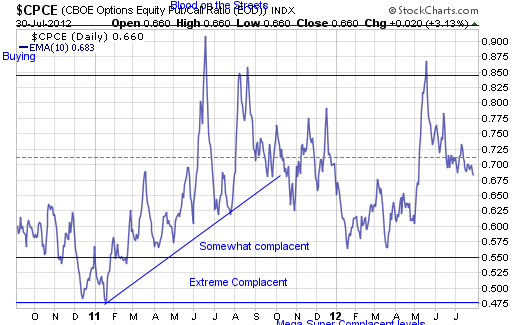 (see chart below) Right now volatility is fairly normal. DOES THE $COMPX CHART CONFIRM YOUR WORK WITH THE $DJI ? which work are you referring to? I generally use the Nasdaq for my timing signal because I believe technology always leads the market higher. 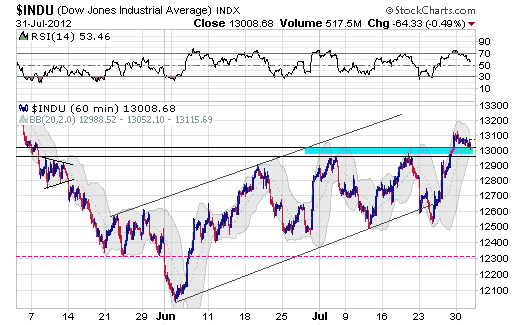 YOU PRESENTED THE $DJI HERE TODAY AND I THOUGHT THAT THAT WAS YOUR EMPHASIS FOR THIS ARTICLE TO PRESENT A BROADER PERSPECTIVE THAN TECH ISSUES.